The lacrosse kit helmet, glove & stick personalized Christmas ornament looks like gear that is ready to grab and hit the field. 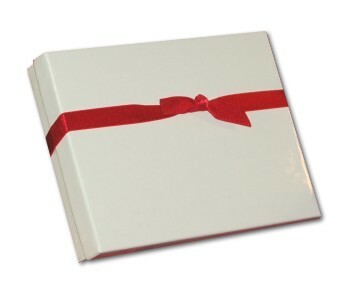 It's one of the most authentically styled sports ornaments personalized for the recipient that we offer. 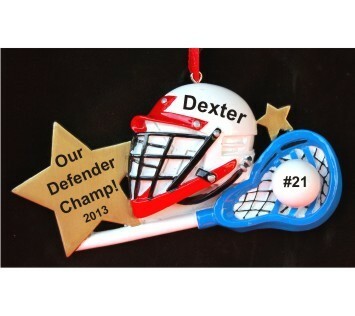 These customized lacrosse ornaments include your player's information as shown. A lettering artists will paint it on by hand in a very stylish font to create a personalized lacrosse gift that is one of a kind. Show your support for one player, or have lacrosse gear personalized Christmas ornaments made up for everyone on the team! They'll score for sure when arriving in our custom velvet gift bag. Lacrosse Equipment Gift Oct 7, 2017 Paula J.